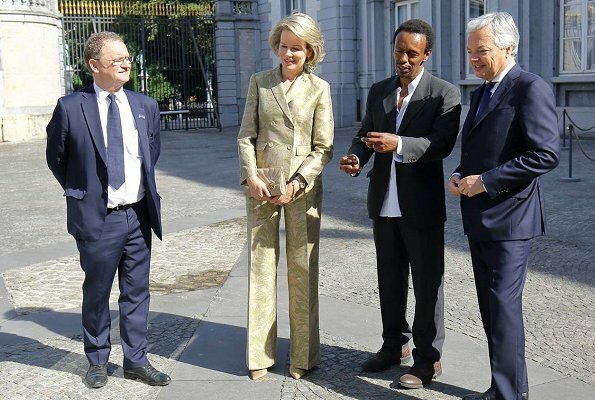 On July 18, Queen Mathilde attended the official opening of Africa Museum exhibition held at the Egmont Palace in Brussels. 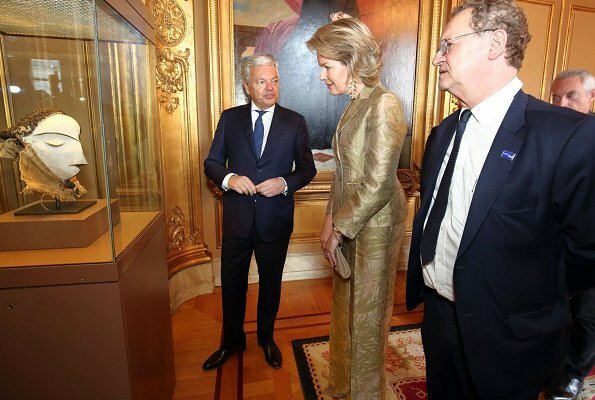 The exhibition is an initiative of the Belgian Ministry of Foreign Affairs in collaboration with the AfricaMuseum. 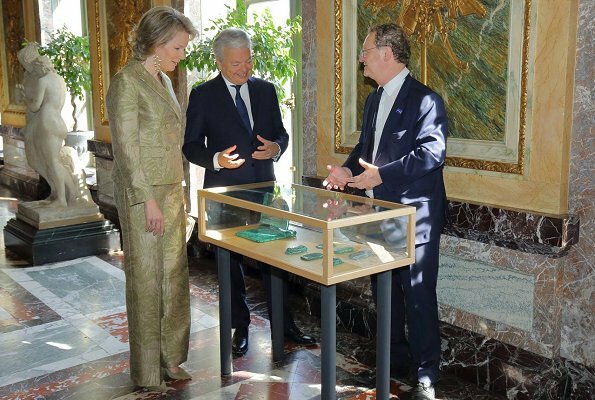 It is the 7th edition of the Summer exhibitions in the Egmontpalace that are organised around the National Day. 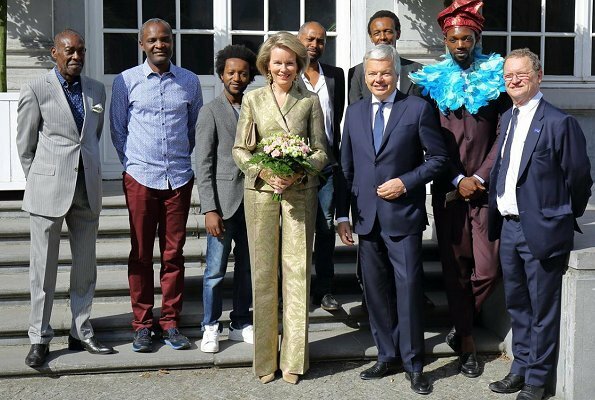 The exhibition “AfricaMuseum @ EgmontPalace” brings about 10 collection pieces of the museum into dialogue with about 10 art works of contemporary artists. It's a bit much for my taste - she looks a bit like a luxury chocolate to me. The suit itself is well tailored and she wears it well but I don't really like it. Mathilde looks like a shiny gold statue lol. The third picture is the best for me as it is from the waist up. I would have preferred a skirt or trousers in one of the colors from the jacket, cute earrings. Suit maybe fits more on evening event than only opening exhibition. Mathilde is mooi in dit pak, maar ik vind het niet geschikt voor een hete zomerdag. Een fleurige outfit zou beter zijn. Ben benieuwd wat ze 21 juli zal dragen. Looks like Natan again with this stiff shiny material. I cannot imagine why these ladies continue to patronise him. Luxury chocolate I agree!! I love her suit. It goes with the opulence of her surroundings. Agree - I like it too. The colour and fabric suits her, especially the jacket, and as you say it goes with the surroundings. It´s a well-fitted suit, in fact it´s the best fit of a suit I´ve seen in a long while. Perfect trouser length, straight leg, great cut, even the double-breasted jacket (which is tricky to wear for most women) looks good here. I don´t personally like the fabric as it would look costum-y in my everyday life, but on a queen it kind of works, and for this particular event it makes sense: I think it´s a nod to the usually very rich african fabrics and colours (African exhibition), plus it fits right into the setting which looks like a luxurious palace with lots of gold used in its interior design. I totally agree with you. She is stunning and the fit is great, the fabric again looks like upholstery. Beautiful! The fit is perfect. The material, a rich brocade, is spectacular. The leaf design is echoed in the earrings. A gorgeous and elegant Queen! 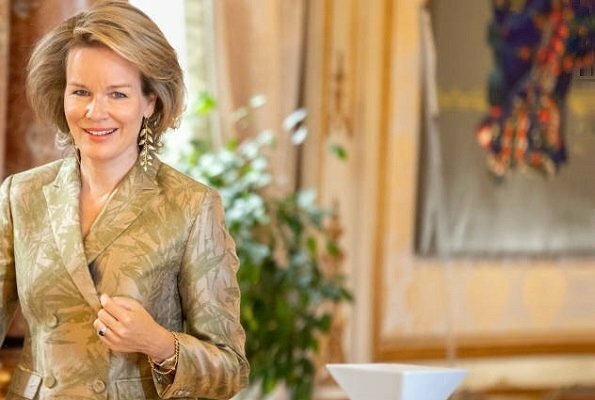 Today Mathilde is the Lady in gold. She looks good , but for me to much, maybe pair it with black ,or brown. But she is doing very well by herself my input is not needed. Looks quite good to me, incl the material which is nice and suitable for an event in relation with African nature, it is rich and does not look at all as an "old sofa". A very good choice for the ocasion this well-tailered suit.